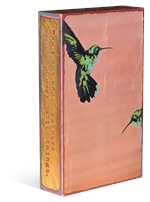 The Santa Fe Shop is the only Certified Sergio Bustamante Jewelry Gallery in the US and Canada and carries a huge selection of Sergio Bustamante. All Sergio Bustamante jewelry come with a gift box and Certificate of Authenticity. The Shop is located in Historic Downtown Cedarburg, WI. Free Shipping on Sergio Bustamante Jewelry! 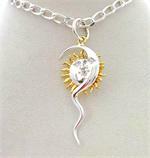 2.75" long (w/bale) by 1" wide Eclipse Tenerife pendant by Sergio Bustamante: 22k gold on sterling silver. #724027. 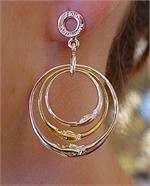 Sergio Bustamante Triple Moon Hoop Earrings (722020). Gold/Silver: Total length is 1.75".